Aldi is now carrying a budget ereader in its stores in Belgium. It doesn't look like much, and frankly we don't know much about it, but it does offer a new option for readers. The Billow BK6031L has a 6" E-ink screen with touchscreen and frontlight. It packs in 4GB internal storage and a microSD card slot, but there's no mention anywhere online of Wifi, audio, or the actual screen resolution. So of course buyer beware. Lesen.net is saying that there is no Wifi, and my gut says they're probably right. If that is true then a reader is going to have to transfer ebooks over USB (both Epub and PDF are supported, including DRMed ebooks). Some would say that this is beyond the skills of most ereader owners, and that they would be better off with the basic Kindle (which is 20 euros cheaper in Germany), but there have been any number of budget ereaders launched in Europe (especially in Germany) with similar limitations and they did well. With a retailer that operates in as many countries as Aldi, I regularly read of its first offering of a product. 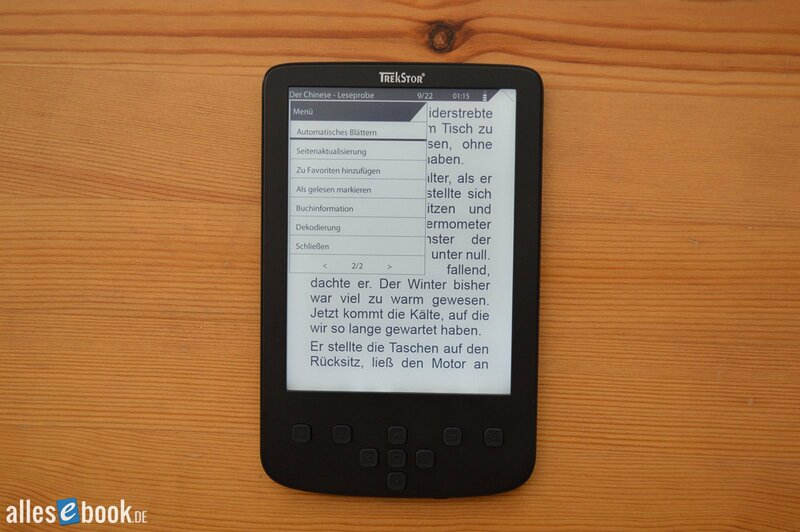 But in the case this ereader from Billow, what we have here is at least the third ereader sold by Aldi. I know of a model with a 7" LCD screen which was sold in Australia in 2012, and Aldi also sold a 6" ereader in the Netherlands in 2010. The lesen.net article says, the screen is illuminated (“ein beleuchteter Sechs-Zoller”, “an illuminated six-incher”). Designwise, the device resembles the Pyrus 2 LED, so this might be a derivative with improved specs (TS and larger storage capacity). Looking at the image pictured on the website ), the software also looks similar (http://allesebook.de/wp-content/gallery/trekstor-pyrus-2-led/pyrus-2-led-09.jpg). That’s probably what Rockchip’s SDK for e-ink devices uses by default with a few alterations. gTranslate was garbling the listing, so I wasn’t sure whether it did have a frontlight. But on second thought I will just go with Johannes report. This reader has a Boxchip/Allwinner E200 CPU and not a Rockchip. The original is called Gajah 6011B which was never released as separate product. Still Gajah (Singapore) added front-light (FL) support and the product was marketed initally as Oaxis E6L. Later numerous european companies licensed the design and issued their ereaders, including (list may be expanded further) – Evolio (as Evobook 3; Romania), Lark (as Freebook 6.1; Poland), Qumo (as Libro Lux II and Libro Basic, one with FL support, the other – without it; Russia), Woxter (Paperlight 300 and Scriba 190 Pearl – same case – with/without FL; Spain), approx a.k.a. Aqprox (appEB04E, Spain) and of course – the already mentioned Billow (E01E and E02FL – with/wihtout FL) and TrekStor (Pyrus 2 LED – with FL). All firmware updates for these devices are interchangable (where available at all for free download), with the Pyrus 2 LED having the latest firmware (by date), but Paperlight 300 – the most stable and funcional of them all.